The Strengthening Urban Engagement of Universities in Africa and Asia (SUEUAA) project team involves academics from six cities in the Global South: Johannesburg (South Africa), Dar-es-Salaam (Tanzania), Harare (Zimbabwe), Manila (Philippines), Sanandaj (Iran), and Duhok (Iraq); and one city in the Global North, Glasgow (Scotland). At times this blog will highlight incidences where the team members were offered the opportunity to give presentations, lectures, seminars, in order to highlight the public engagement work of the team. 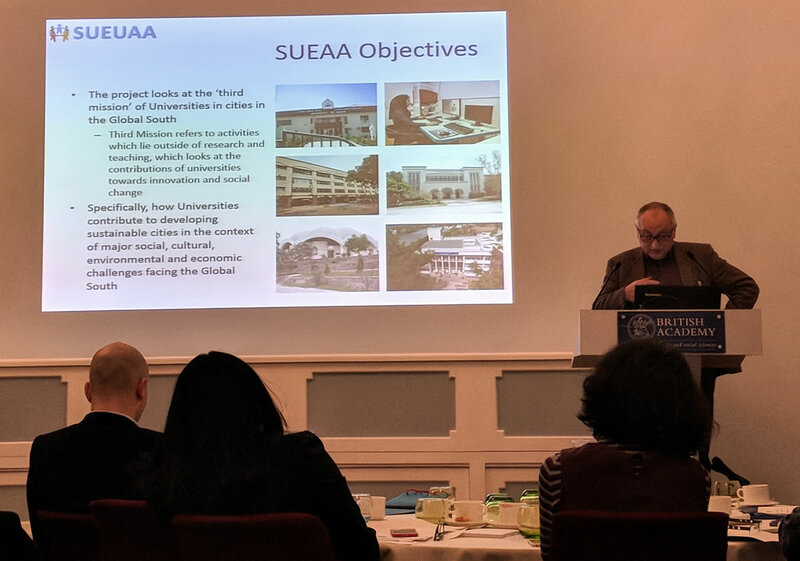 Mike Osborne and Kasia Borokowska were very pleased to be able to represent the SUEUAA project at the second meeting in London on 19 June of projects funded with the British Academy's Cities and Infrastructure Programme with the Global Challenges Research Programme. We were joined by representatives of other projects, each reporting on their progress. It became very evident that much synergy exists within the programme, and we were very pleased to be approached by colleagues from Mexico interested in joining our project. On the 19th and 20th of February, the British Academy (BA) invited the 16 projects funded under their Global Challenges Cities and Infrastructure call to attend a two day event in London. SUEUAA was represented by Professor Mike Osborne, Dr Muir Houston, Dr Jo Neary, and Dr Neil Burnside. The first day was an opportunity for networking and for each of the funded projects to outline their aims, objectives, and methodologies by way of a short 10 minute presentation. The Strengthening Urban Engagement of Universities in Asia and Africa (SUEUAA) project team were delighted to welcome Professor Caroline Knowles, Programme Director of the British Academy’s Cities and Infrastructure Programme, this week for a meeting in the School of Education at the University of Glasgow. This year, the British Academy’s Global Challenge Research Fund (Cities and Infrastructure) funded 17 projects across the UK, all of which looking at aspects of how to create and maintain sustainable and resilient cities in developing countries, of which SUEUAA is one*. 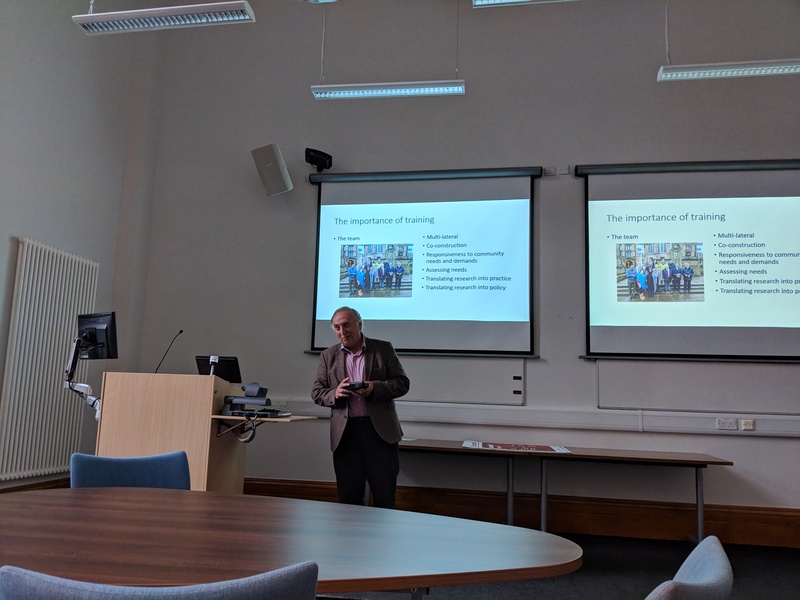 During the first SUEUAA meeting at the University of Glasgow (December 18-20, 2017), the Partners involved in the project discussed the implementation of two benchmarking tools; one for higher education institutions, and one for city stakeholders in the context of learning cities. John Tibbitt, Deputy Chair of the PASCAL Observatory joined the delegates to discuss the importance of benchmarking and to present how the tools can be applied in different contexts. We were delighted to be able to host delegates from all six partner countries at the first project meeting and international seminar for the Strengthening Urban Engagement of Universities in Asia and Africa (SUEUAA) project held at the University of Glasgow from 18-20 December 2017. This project funded by the British Academy under the Cities and Infrastructure programme, which is part of the Global Challenges Research Fund. The project led by the University of Glasgow includes six international partners from Iran, Iraq, the Philippines, South Africa, Tanzania and Zimbabwe. CR&DALL (the Centre for Research and Development in Adult and Lifelong Learning), the School of Education at the University of Glasgow and its partners would like to invite you to an international seminar to launch the Strengthening Urban Engagement of Universities in Asia and Africa (SUEUAA) project funded by the British Academy under the Cities and Infrastructure programme, which is part of the Global Challenges Research Fund. The project led by the University of Glasgow includes six international partners from Iran, Iraq, the Philippines, South Africa, Tanzania and Zimbabwe. The seminar will introduce the work of the project, and include both keynotes and breakout discussion groups around some of the issues identified in an earlier scoping exercise.